Sometimes you need to find all files which have no data for a given metadata tag. Maybe you need to find files without a description, or files which have no keywords yet. 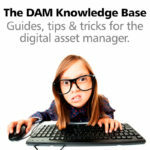 This can be easily achieved with the digital asset management system IMatch. We use the Value filter for this purpose. Open the Filter Panel via View > Panels > Filter or the keyboard shortcut <F9>,<L>. If no Value filter is visible in the panel, click on the Gear icon in the toolbar and choose it from the drop-down menu. 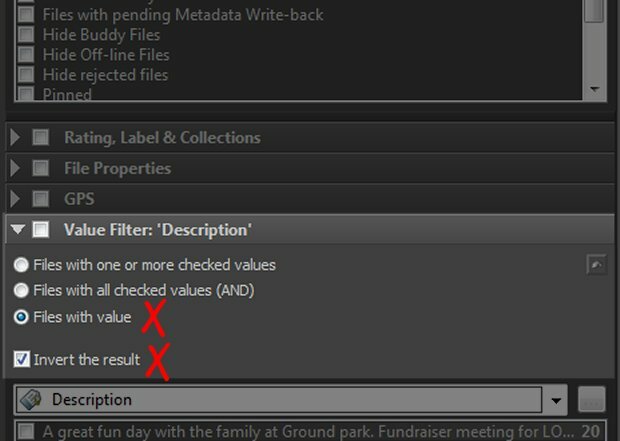 In the Value filter, select the metadata tag to use. For this example, we used the Description tag. This procedure of course works with all 14,000 metadata tags currently supported by IMatch. Enable the option Files with value. This tells the filter to search for all files which have data in the selected tag. It removes all files without data from the File Window. Now enable the option invert the result. The filter now filters out all files which have data for the tag, leaving only files without data in the file window. And this is what we wanted: All files without a description. To find all files without a description in your entire database, just select the Database node in the Media & Folders View or the @All category in the Category View. If you need this filter often, save it. You can then apply the filter any time by just clicking it in the filter list in the Filter Panel.